The objective was to evaluate a visible-light-transillumination (using Digital Imaging Fiber-Optic Transillumination machine: DIFOTI) method using occlusal view (DIFOTI-occl), axial view (buccal and lingual: DIFOTI-axial), and combination of all views (DIFOTI-all) for detecting non-cavitated approximal caries and to compare its performance to visual examination (International Caries Detection and Assessment System: ICDAS). 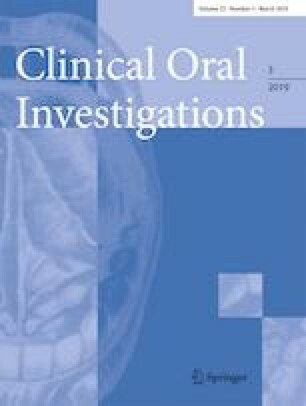 Thirty extracted human premolars were selected (sound to lesions into the outer one-third of the dentine) based on micro-computed tomography (μ-CT). Teeth were mounted in a custom-made device to simulate approximal contact. DIFOTI (Electro-Optical Sciences Inc., Irvington, NY, USA) images were obtained from the occlusal, buccal, and lingual views. DIFOTI image and ICDAS examinations were performed and repeated by three trained/calibrated examiners. Sensitivity, specificity, area under receiver operating characteristics curve (Az), inter- and intra-class correlation coefficients (ICCs), and correlation were determined. Sensitivity/specificity was for DIFOTI-occl: 0.42/0.75, DIFOTI-axial: 0.86/0.93, DIFOTI-all: 0.91/0.69, and for ICDAS: 0.89/0.83. Az for DIFOTI-occl was significantly lower than that of DIFOTI-axial (p < 0.001), DIFOTI-all (p = 0.002), and ICDAS (p = 0.005). Spearman correlation coefficients with μ-CT for DIFOTI-occl (r = 0.39) showed weak association, while DIFOTI-axial (r = 0.80), DIFOTI-all (r = 0.91), and ICDAS (r = 0.90) showed moderate association. ICCs for intra-examiner repeatability/inter-examiner agreement were for DIFOTI-occl (0.64/0.58), DIFOTI-axial (0.92/0.89), DIFOTI-all (0.85/0.83), and ICDAS (0.79/0.72). The results of the current in vitro study suggest that, for detection of non-cavitated approximal caries lesions, DIFOTI performs better using axial than occlusal view. Approximal non-cavitated caries detection is challenging. DIFOTI can observe images from occlusal-, buccal-, and lingual views. DIFOTI and visual (ICDAS) examinations of buccal- and lingual- and all-views are more suitable than those of occlusal view for a detection of non-cavitated approximal caries. The authors thank Drs. Anderson Hara and Ana Gossweiler, Indiana University School of Dentistry (IUSD), to participate in this study as examiners. We thank Dr. James C Williams, Department of Anatomy and Cell Biology, Indiana University School of Medicine for the assistance with Skyscan microfocus computed tomography. This study was conducted in Indiana University School of Dentistry, USA. This work was supported by Indiana University School of Dentistry, Department of Cariology, Operative Dentistry and Dental Public Health, 2016; and by Dental Master’s Thesis Award Program from Delta Dental Foundation (Okemos, MI, 2016). The funders had no role in study design, data collection and analysis, decision to publish, or preparation of the manuscript. The roles of authors were: conceived and designed the experiment: N. Abogazalah, G.J. Eckert; and M. Ando; performed examinations: N. Abogazalah and M. Ando; perform statistical analyses: G.J. Eckert; and wrote the paper: N. Abogazalah, G.J. Eckert; and M. Ando. The work was supported by the Dental Master’s Thesis Award Program from Delta Dental Foundation.